The Art Deco era of the mid-1920’s through the 1930’s was the time of the greatest popularity of coin activated diggers. It was during that period when most of today’s most valuable antique models were produced. In the 1930’s there were over 35 companies building and selling diggers, and the competition for sales often centered on the cabinetwork. Sales were directed to the operators of Penny Arcades, Boardwalks and Beachfront Amusement Parks in areas of high population. The more elaborate models were designed to be operated in the finest Hotel Lobbies, Department Stores, and Train Stations of the day. These “Hotel Models” were sold as floor-standing consoles, and the woodwork was often similar to fine wood furniture; usually embellished with polished and painted cast metal trim in Art Deco style. Almost all of these machines play-through a cycle powered by an electric motor, however some companies offered hand crank and electric models in countertop design to sell to traveling operators. A few diggers of the Deco Era category were built during and after World War II, but in 1951 a new Federal Law, the Johnson Interstate Transportation Act, classified all diggers as “Gambling Devices” and electric diggers, of Deco style, were frozen in time. Following this sudden ending a group of carnival digger operators was successful in having their type of diggers reclassified as “Amusement Devices” in 1953, but this type had no electric motors and no coin slots. Consequently, there were no more of the “Deco Era” cranes and diggers produced after 1951. From the time of the first factory production of digger games in about 1924, diggers have been used extensively by traveling carnival operators. Carnivals, as a business, were developing at the same general period in time as digger machines and slot machines were becoming popular. Early carnival companies did not always have reliable electric service so the ‘hand crank’ models were the choice of most operators. This put the Erie Digger in the forefront of sales to the traveling showman. Exhibit Supply Co., International Mutoscope Reel Co., Bally, Scientific Machine Co. and others followed suit by offering hand-crank models. Also, the carnival operators favored the smaller, lighter, ‘counter top’ models because they could be easily transported by Railway Express in their original shipping crate, and the crate could then be used as a stand for the digger upon arrival at the show grounds. Carnival diggers during that era used cash currency and silver coin in the play field as prizes to entice repeat play. The early carnival diggers actually brought gambling machines to small town America. 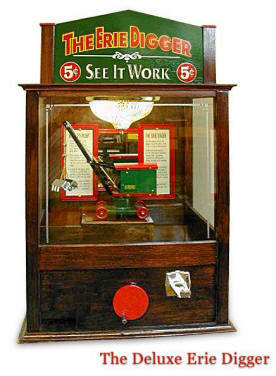 Chancing a penny or a nickel to win a Silver Dollar coin made the carnival diggers very popular during the depression. The entire digger business ended abruptly in 1951 with the enactment of the Johnson Interstate Transportation Act, which classified diggers as ‘Gambling Devices’. A group of carnival digger operators, led by Lee Moss, banded together to have their type of diggers exempted and they were successful in obtaining a new classification for diggers as “Amusement Devices”. As a result diggers were operated differently from 1953 until the late 1970’s to comply with Federal Law. This is why many of the diggers currently available to the collector market are found without electric motors, coin mechs, prize chutes, or locking cabinet backs.